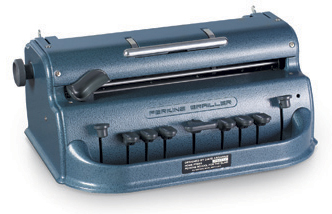 The Standard Perkins Brailler will meet the needs of most people. It is sturdy and portable and can emboss 25 lines with 42 cells on an 11" x 11 1/2" sheet of paper. Includes dust cover and wooden eraser. Braille - is based on six dots, like the design on a domino: it consists of 63 symbols made up of all the possible variations of these dots. 26 of these represent the letters of the alphabet and 10 punctuation marks. They can be used simply to produce a letter-by-letter copy of print. It is seldom used, as it takes up a lot of space and is comparatively slow to read. Grade 2 braille was developed to reduce the size of books and make reading quicker. Other symbols are used to represent common letter combinations, for example 'OW', 'ER', and words such as 'AND' and 'FOR'. Combinations of two symbols are also used to represent some words, eg 'THROUGH'. Some characters may change their meaning, depending on how they are spaced.